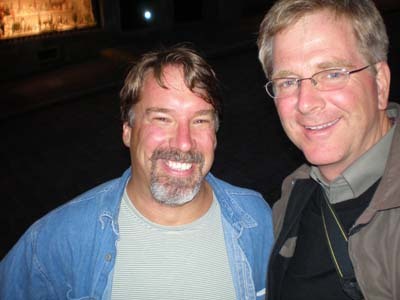 Rick Steves was in Rothenburg the last couple of nights, updating his popular guide book and basically causing a miniature earthquake everywhere he went among tourists who know his TV show and books. Rick is a Super Celebrity among the traveling masses. His more than 20 years of providing homespun advice on how to save money while traveling has spawned a multi-million dollar business back in the USA built around cheap travel. I had always thought that Rick was the stimulus for the misbegotten idea of getting all that you can and then being offended at having to pay for it. Turning an adventure into a game of ‘How cheap can I get this?’ Time after time as I flipped through his books I would be astonished at his choices of hotels and restaurants, knowing that I would never consider sleeping or eating at those places. They got into the book because they were cheap or in some way, quirky. I was confused for years about this kind of travel philosophy. It’s always been my theory, even when I was young, to enjoy life and get the most out of travel, even if it cost a little more. That’s the philosophy behind European Focus Private Tours. I learned this during five years of travel for the European Stars and Stripes, when I was lucky enough to go out and learn how to travel around Europe and have fun – and get paid for it. I was a sceptic about Rick at first, maintaining the philosophy of enjoying Europe and its pleasures and damn the torpedoes, (and cost) full steam ahead. (Someone who contacts me about a tour and asks right off the bat, ‘How much does this cost’ is probably not going to be considered for one of our limited spots) I do admit that many of our clients have initially been turned on to the idea of traveling Europe by watching his hugely popular show on PBS. I’ve had a turnaround in the last few years, though, in my opinion of what Rick is doing. Rick’s writings on Global Warming, Ugly Americanism and how America is not ‘Number One’, have all come together to convince me that this man is using the bully pulpit created by his immense popularity to try and reach through all of the mania to spread a message that we need to be better stewards of the planet, that we need to calm our American energy down and that we need to respect other cultures. We’re the guest, they’re the hosts and therefore, we play by their rules. Yes, we have a strong economy but the Europeans have more than 450 million people now in the Euro zone and our dollar is getting beaten down into the cobblestones of quaint and increasingly expensive Old Europe. We can’t get all upset because a place is not air-conditioned and we can’t get ice cubes in our Diet Coke. Something that really impressed me was when I learned that Rick’s company has just donated $80,000 to an outfit that will plant trees to offset carbon emissions caused by all of his estimated 13,000 tour goers who use planes to get across the Atlantic. It was one of the highlights of my career last night when Rick invited me to sit down with him while he checked out a local restaurant, the Burgerkeller, which is owned by our next door neighbor here in Rothenburg. I sat for more than an hour and discussed travel, shared anecdotes and our concerns for the planet with a tired, but still alert and observant, living legend of travel. I really have to admit that I like Rick Steves. Go get ’em, Rick. I’ll be reading and following along. Posted in Europe Tours and tagged derheim, europe, get, rick steves europe.